Marine oil spills can have dire consequences for the environment. Research on their dynamics is important for the well-being of coastal communities and their economies. Propagation of oil spills is a very complex physical-chemical process. As seen during the Deepwater Horizon event in the Gulf of Mexico during 2010, one of the critical problems remaining for prediction of oil transport and dispersion in the marine environment is the small-scale structure and dynamics of surface oil spills. The laboratory experiments conducted in this work were focused on understanding the differences between the dynamics of crude and weathered oil spills and the effect of dispersants. After deposition on the still water surface, a drop of crude oil quickly spread into a thin slick; while at the same time, a drop of machine (proxy for weathered) oil did not show significant evolution. Subsequent application of dispersant to the crude oil slick resulted in a quick contraction or fragmentation of the slick into narrow wedges and tiny drops. Notably, the slick of machine oil did not show significant change in size or topology after spraying dispersant. An advanced multi-phase, volume of fluid computational fluid dynamics model, incorporating capillary forces, was able to explain some of the features observed in the laboratory experiment. As a result of the laboratory and modeling experiments, the new interpretation of the effect of dispersant on the oil dispersion process including capillary effects has been proposed, which is expected to lead to improved oil spill models and response strategies. ©2016. The Authors. 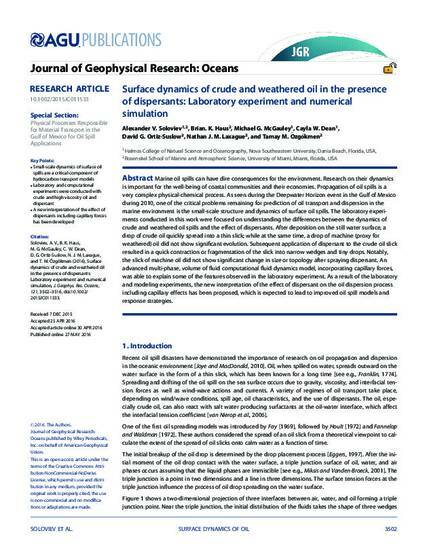 Journal of Geophysical Research: Oceans published by Wiley Periodicals, Inc. on behalf of American Geophysical Union. This is an open access article under the terms of the Creative Commons Attribution-NonCommercial-NoDerivs License, which permits use and distribution in any medium, provided the original work is properly cited, the use is non-commercial and no modiﬁcations or adaptations are made.